This post was contributed by Professor Leslie J Moran, of Birkbeck’s School of Law. 1st October 2009, the opening day of the new Supreme Court of the United Kingdom. 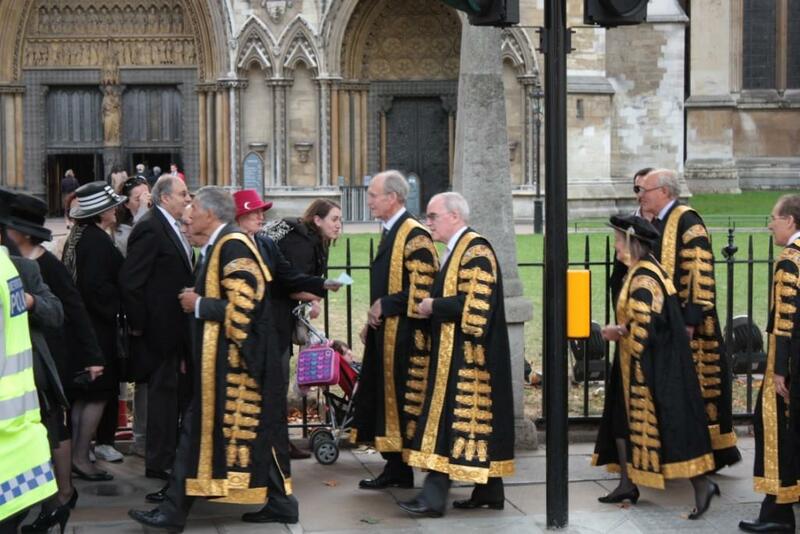 Judges of the Supreme Court dressed in their gilded ceremonial robes of office negotiate their way through a group of pedestrians as they process from the Court to Westminster Abbey to attend the Judges Service to celebrate the opening of the new legal year. © Leslie J Moran 2014. How about drawing me a picture of a judge? Use your mind’s eye; make a mental picture. What is in your picture? What is the judge’s pose? How is the judge dressed? Are there any props? If so what are they? Now take a moment to reflect. What is being represented? If you showed the picture to a friend, colleague or fellow commuter and asked, ‘What does this represent?’ what would be the reply? What does your picture say about the qualities of a good judge? Or maybe you have produced a picture that portrays some of the common criticism of judges: ‘pale, male and stale’, remote, stuffy, out of touch, and out of date. Where did you get the ideas and images from? How accurate are they? I hope this exercise has given you a little food for thought. It is an exercise that is intended to draw you into the heart of a new research initiative at Birkbeck entitled Judicial Images; image making, management and consumption. Funded by the Arts and Humanities Research Council, the goal is to build a network of people who work in the media and culture industries, the judges and their media advisors who commission and manage them, together with scholars from a variety of disciplines, including art history, film and television studies, sociology and cultural studies, from the UK and beyond to study judicial images. It is a pioneering initiative that builds on my research into the judiciary. If the study of pictures sounds distinctly out of place when it comes to research on the judiciary the message of this initiative is, it’s time to think again. The network will examine the power of visual images to communicate ideas about judges and the justice system past, present and future. The power of pictures is not a recent discovery here. Sculptures and painted portraits of judges have been produced and displayed since at least the 16th century. In the Victorian era small photographic portraits of judges were collected and arranged in albums with other celebrity figures of the day. Today it’s all about the moving image; film and television portraits in documentaries, news reports and courtroom dramas such as G.F. Newman’s highly acclaimed Judge John Deed. This is a very timely initiative. As of October 2013, the English courts opened their doors to the television cameras. They are currently confined to the Court of Appeal. ‘Open justice’ and ‘public education’ jockey for position as arguments justifying calls for TV cameras in criminal trial courts. But TV is already awash with news stories and fictional accounts – courtroom dramas, that touch on the work of judges. But fictions are often cast as second best. Reality is the thing. The specter of declining standards of journalism and tabloid television and press reports that value sensationalism over accuracy haunts debates about better public access to news of what goes on in courts. Concerns continue to be expressed about the impact of media on popular misconceptions about the way courts work and the role of the judge. Pictures of judges dressed in gilded or scarlet robes wearing silk stockings, court shoes and 18th-century full-bottomed wigs regularly accompany news reports critical of judicial decisions, especially so called ‘lenient’ sentences. The worry is that they not only misrepresent today’s judges but that they feed and breed dissatisfaction with, and loss of confidence in, the judiciary. But there has been little research exploring how these images are commissioned and made or how they are used. The network is designed to change that. Three workshops (the first in November 2014) will facilitate new encounters, open up new conversations, and expose participants to new perspectives. The workshops provide a unique opportunity for us to explore the complex processes that go into judicial image-making and image management. These events will be designed to encourage critical reflection about current images. What messages are being produced? What gets left out? How may these images be changed, improved? What can be done to enhance popular perceptions and understandings about the justice system and the role of the judge? A dedicated website will support the whole project. In addition to providing information about the project events the website will also offer a bibliography of key sources for interested members of the public, policy makers, and budding researchers. It will also provide new educational resources. The website also hosts an exhibition. This will be made up of a variety of pictures of judges, some of which I have made during the course of my judicial research (See image above). Others will be from important collections such as the National Portrait Gallery. We also hope to inspire people to make pictures, for example by using Instagram. So don’t delay. Add the finishing touches to your picture. If it’s still a mental one, get out the paper and make a hard copy. If it’s already on paper turn it into a pdf or photograph it and send it in. My contact details are below. A caption or accompanying commentary is optional. I can’t guarantee that it will make the exhibition. I’ll have to consult with my fellow researcher, Professor Linda Mulcahy once a colleague in the Law School at Birkbeck, now in the Department of Law at the London School of Economics. But I will do my best. What I can guarantee is that the exercise will have made you think about one of society’s most important institutions. It will also have made you think about the importance of visual media in shaping your understanding of the judiciary. Leslie J Moran is a Professor in the Law School at Birkbeck. You can contact him for more information about the project or to send your pictures via his email address: l.moran@bbk.ac.uk. Follow the Judicial Images project on Twitter. This post was written by Dr Silke Arnold-de Simine, Senior Lecturer in Memory and Cultural Studies in Birkbeck’s Department of European Languages and Cultures. There will be a conference held at Birkbeck on 10-11 July on ‘Picturing the Family: Media, Narrative, Memory‘; and an exhibition in the Peltz Gallery from 3-25 July, entitled ‘Family Ties: Reframing Memory‘. The family is seen as a privileged site of memory transmission both in terms of the stories which are told and passed down the generations as communicative memory, but also in terms of the unspoken and unspeakable memories which are acted out in families and passed on to children without ever being acknowledged. Marianne Hirsch has introduced the concept of ‘postmemory’, something that Abraham and Torok describe as ‘transgenerational haunting’, the ‘phantom effects’ that haunt the children of parents who have lived through unprocessed traumatic events or repressed and shameful secrets. 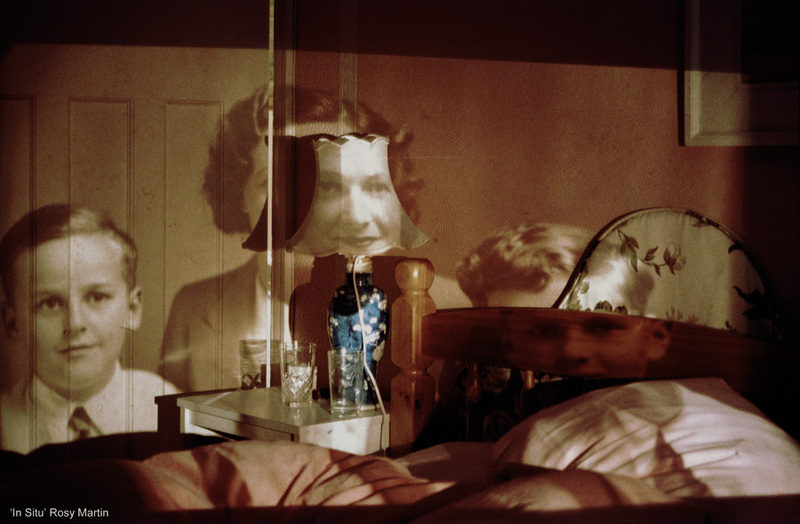 The concept of ‘transgenerational haunting’ is not simply extended to or replicated on a collective level when the history of the nation is seen through the paradigm of the family: shared phantoms can be externalised and become inscribed in cultural practices in an attempt to ‘relieve the unconscious by placing the effects of the phantom in the social realm’ (Abraham 1994: 176) – phantoms which were never restricted to individuals to begin with but only ever existed in an interpersonal and intergenerational dynamic. In contemporary commemoration culture the family has become the central trope through which national history is framed. Around the centenary of the First World War we are faced with a remembrance culture which relies in all its scripted rituals, TV programming and exhibition planning on the input of the public who is made to feel that they are provided with a forum for their stories, their family’s personal memories, rather than a top-down version of events. A pan-European website, Europeana 1914-1918, promises untold stories alongside official histories of WW1 and includes digitized documents and film material from libraries and archives but also 90,000 personal papers and memorabilia of some 7,000 people involved in the war, held by their families and digitised at special events – so-called ‘crowdsourcing’ – in 12 countries. It provides access to ‘memories and memorabilia from families throughout Europe’ and users are encouraged to ‘contribute [their] own family history’. That the trope of the family is used to naturalise national alliances is not particularly new, variations on the concepts of ‘fatherland’ or ‘motherland’ can be found in many different languages and cultures, and the institutions of the family and the nation are reaffirmed and reaffirm each other in that process. However, the unpredictability of family stories can also provide an unsettling element and when current European heads of state are given the ‘Who Do You Think You Are? (BBC 1, 2004-) treatment, the results can be difficult to incorporate into an official narrative. Roughly a year ago the German media reported that German chancellor Angela Merkel’s grandfather, Ludwig Kasner (Kazmierczak), who had been of Polish origin but was drafted into the German Army in 1915, had – after becoming a prisoner of war – joined the Blue Army, a unit that fought for Polish independence on the side of the Entente Powers which meant that he probably took part in fighting against Germany. But rather than using this information against Merkel, the image conscious German press celebrated the fact that this made her the most favored foreign politician in Poland. Merkel’s Polish colleague Donald Tusk also had a ‘grandfather affair’ of his own and knows all to well about the pitfalls of the wrong family history when it comes to the conflicts of the twentieth century. During the national elections of 2005, surveys showed him clearly in the lead, but when it was revealed that his grandfather had fought in the German Wehrmacht he lost to the National-conservative party of Lech Kaczynski. These examples show that ‘picturing the family’ is an activity that is clearly fraught with unexpected dangers and while it can be used as a conservative and stabilizing force it can also lead to a defamiliarisation of the past and ask uncomfortable questions about the ways we define our identities in ‘imagined communities’ (Benedikt Anderson).